Animated musical clock with chimes. Behind the glass door with a working clock, the tuned chimes are struck in harmony with a layer of enchanting bell music. 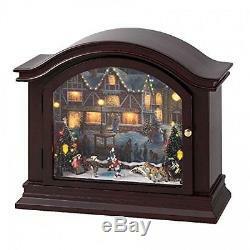 Animated, illuminated holiday scene featuring handpainted figures inside. Plays 35 Christmas carols and 35 year-round classics either on the hour or continuously. UL listed adapter for music box. Packaged in retail gift box. Brand new with original box unopened. Stored in a smoke free environment. Christmas Animated Musical Chimes Dancers #77648 NIB FREE SHIPPING OFFER" is in sale since Thursday, February 19, 2015.